As you, my dear readers, already know by now, my small reviews usually focus on bands in the Brutal Death Metal genre (one of my favorites). Nevertheless, I do like other genres as well, such as Death, Black, Black/Death, and Doom Metal, just to name a few. But when given the opportunity to write for NCS, I wanted to focus on a genre that could use more exposure. Also, Islander and the team of writers do a fantastic job in promoting/writing about all the main genres here. With that being said, in my time here at NCS I have written about some non-BDM such as Mournful Congregation, whose release last year I was privileged to write a few words about. 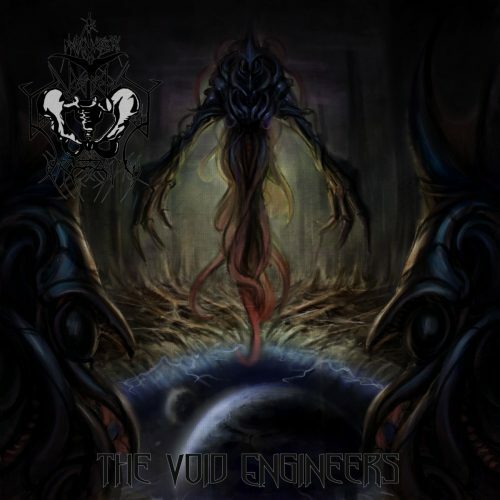 This time around I am very fortunate to do a small write up for Cosmic Atrophy‘s sophomore album The Void Engineers. Simply put, it is for me how Progressive Death Metal should sound, and it has impacted me immensely. This band was founded back in 2008 by Cory Richards (vocals, guitars, bass and drums) and joined by the talented Phil Tougas on lead guitars (Chthe’ilist, Equipose, Eternity’s End, Serocs, First Fragment, Funebrarum and Zealotry). I wasn’t familiar with this project until Mr. Tougas made a FB post about it, and that led me to check out the past releases. The first album, Codex Incubo, was released back in 2008, and it was a strong debut, showcasing a more technical and straightforward approach than what we have in the new album. It displayed great musicianship from start to finish, the music influenced to some extent my Demilich and sci-fi themes. A solid effort — but that did not prepare me for their sophomore album, which is light-years ahead of its predecessor. The new album is still technically impressive, and reveals songs that were thoughtfully created to keep the listener engaged throughout, from the moment you press play. The songs change as they unfold, with guitar solos often a the main characters for the change. Each song is so well-crafted, and when you read the lyrics, it might be taken for an obscuce sci-fi score. The production quality enhances the vision that we are in an obscure part of space, and each of the instruments is audible and does not overshadow any of the others; the melody sections are also a major plus. As mention, there is a Demilich influence (at least for me), but the way the band evolved, they have certainly created their own sound and proven a high level of musicianship. One key improvement over the first album is in the vocals, which are more vibrant and diverse in each of the songs. They have brought more depth and richness to the chapters, creating the feeling that the music is telling a story. The guitar performances are of course outstanding, dextrous and precise, and the solos are so good they sound inhuman (and made me want to start learning the instrument). The sounds of synths and strings in some sections takes you to the world of pulp horror films from the ’50s – ’70s and the old chamber orchestra scores (as well as the pioneering days of synthesizer music making its way into the sonic DNA of horror films) of the late ’60s and early ’70s. Hit the play button and read the lyrics, and the listening experience will just Become more rich and addictive. For me, this album is one of the greats of 2018; this is a project that should get more recognition. So give it a chance and listen below to the full stream of the album, which is being released today — November 30th .